AVG Internet Security is well-known security software that provides proactive protection against viruses, worms, spyware, and Trojans. The new AVG Internet Security 9.0 comes with maximum protection with real-time scanning, automatic updates, and low-impact background scanning for online threats. In addition, AVG Internet Security 9.0 has added identity theft protection, cutting-edge anti-spyware technology, superior phishing protection, and automatic threat handling technology that can automatically heal or remove infected files and other threats. AVG’s security software is popular worldwide with 80 million users in 165 countries. AVG Internet Security 9.0 normally cost $54.99 to purchase a license for 1 year subscription for 1 PC. As part of winter holiday promotional, AVG is giving away AVG Internet Security 9.0 registration license code valid for 3 months (90 days) and unique opportunity to purchase a license two years with a 20% discount. Enter the password “ZIMAZAVG”, which provided as part of joint promotion with the Chip magazine to the text box next to “Hasło z Chip”. Then fill in the name, email address, and phone, and click on Wyslij dane button. A conformation email from “Lista wysyłkowa AVG” will be sent to registered email’s Inbox. Click on the conformation link in the email. The second email from AVG with three-month full version AVG Internet Security 9.0 license number will be sent to the mailbox instantly. Install and activate the AVG Internet Security 9.0 with the free license number received. 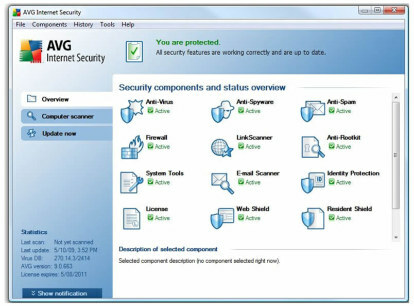 AVG Internet Security 9.0 supports Windows 2000, Windows Vista, Windows XP, and Windows 7. There are also free licenses for more anti-virus products.